Honda Civic 2016 has whipped everyone into a frenzy. 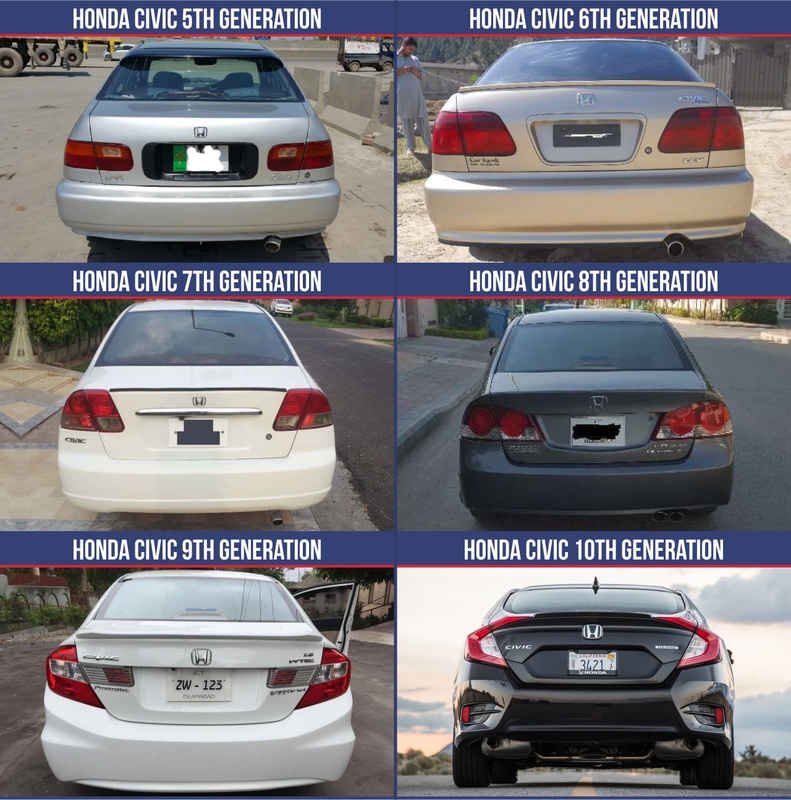 We thought it would be a fun idea to show a visual comparison of all the generations launched in Pakistan from the fifth generation that was launched in 1994 to the current 9th generation Civic, which was launched in 2012. And now hopefully, we will get the 2016 Civic in September next year as well. We will not go into technical details, and just stick with the basics. Fifth generation was internationally launched in 1991 to 1995, but in Pakistan, it was launched in 1994. It is still lovingly known as the dolphin shape among its enthusiasts. It came with your good ol’ carburetor engine in Pakistan. Sixth generation Civic was launched in 1996 and went to live until 2000. It came with two engines, the EXi with a 1.5l efi engine, and 1.6l efi V-TEC for the VTi variant. Both manual and automatic transmissions were offered. 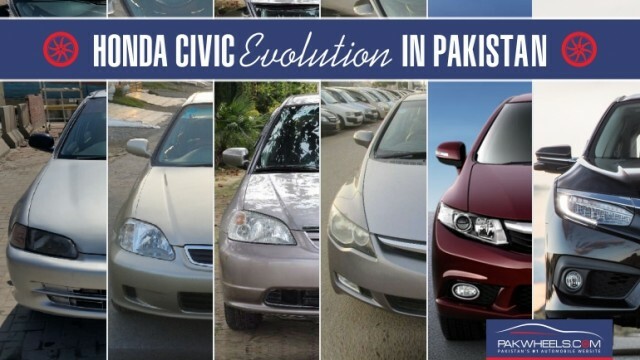 Seventh generation Honda Civic was launched in 2001 in Pakistan and lasted till 2005. Again it had both 1.5l non VTEC and 1.6l VTEC engines. Both manual and automatic transmissions were offered. 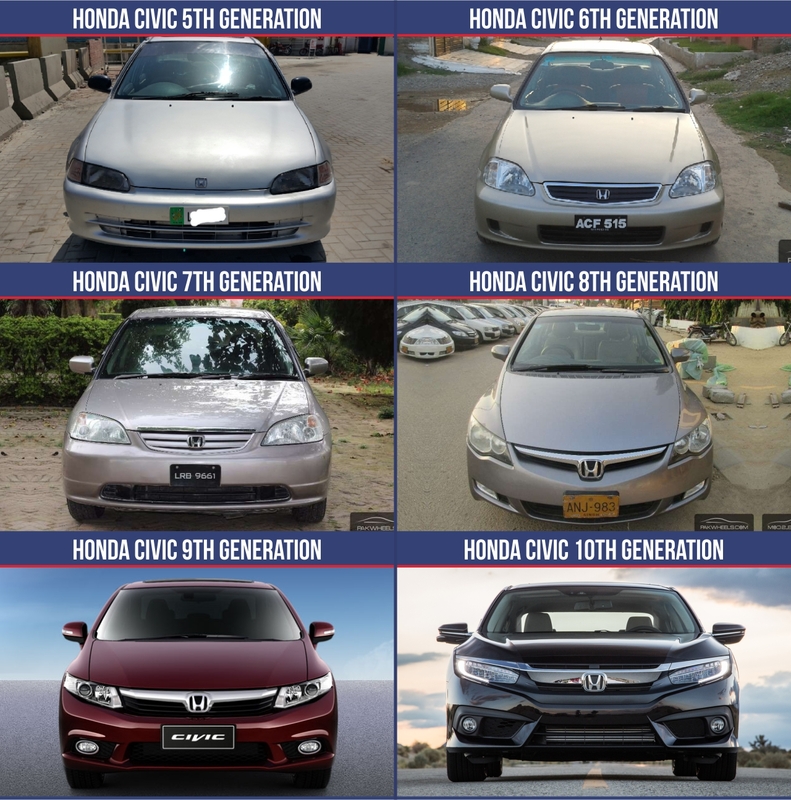 Eight generation Civic, also called ‘Reborn’ by Honda fans, was launched in Pakistan in 2006. It lived until 2011. Honda dropped lower level 1.5l model and brought a 1.8l R18 engine. Civic with auto transmissions were quite liked in domestic market. This time, it was i-VTEC kicking in, instead of your regular VTEC. 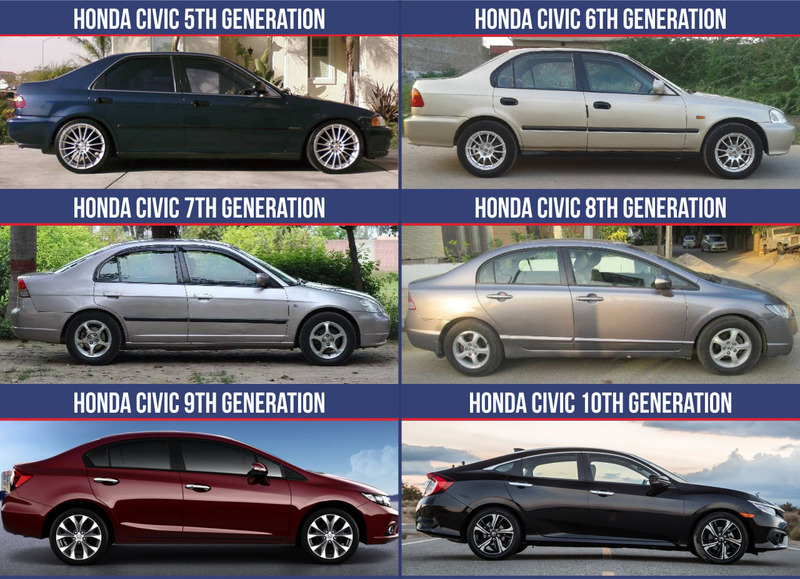 Ninth generation is the current shape Honda Civic that we see on road now a days. It was launched in 2012 and you can still buy a new one from Honda showrooms. It had the same R18 but was slightly tweaked, and produces 141 hp. Now the real hero of the story, the tenth generation 2016 Honda Civic has been launched internationally and hopefully we will get it in September of 2016. The new Civic has a 1.5l turbo charged engine, and produces more than 170 hp. There is 2.0l NA engine as well but chances of it coming to Pakistani Civic are slim. For the launch video of the 10th gen Honda Civic, click here. And for the photos of the event, click here. You can discuss the Honda Civic here. 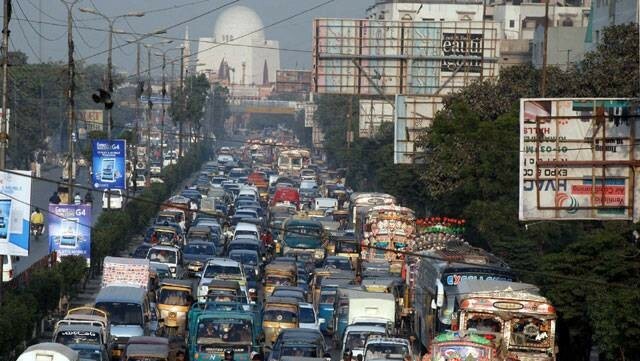 Ever Wondered Why You Are Stuck In Traffic When You Can't See Any Broken Down Car? A Toyota fan here. I must say Honda has done an amazing job with the 10th Generation Civic. It clearly shows that they have put in alot of efforts and attention to the new civic. Well balanced design and especially thank god they finally changed the interior and did a great job on the interior. I am totally in love with the new civic. Its definitely going to give a tough time to current gen Corolla. Thanks to Honda for finally changing the typical predicted Civic design structure and ideology. Great job Honda and well done. Definitely on my to purchase list.